And we did. We finished the last six weeks of school and all students and staff came out alive. Then the new school year started. To say it’s been difficult would be putting it mildly. For a host of reasons, the entire school, parents, staff, and students have been struggling. It has taken all my energy to get through each day so I could go home, eat something, and go to bed. I almost quit last fall. I wasn’t the only one. But now it’s Spring, the time of year when everything seems fresh and new. And many things are fresh and new at school. We have a new superintendent, a new principal, students have come and gone, and I am left with twenty-one students who still wear me out, but I can honestly say I love all of them. And in one more week, I can start counting down the weeks on my fingers. So I know I can do this. This morning’s daily Facebook check led me to several posts written by my nephew’s wife, whom I adore. Post after post about a young man named Eric Williams. He was a friend of my nephew and his wife, and they are grieving deeply. Sgt. Williams was killed in Afghanistan last month, as he was headed back home after his second tour of duty. He was a medic. Jess posted links to articles written about their friend and about his funeral service. What struck me was this young man’s character. A friend whose life was saved by Sgt. Williams, spoke at the funeral. A large group of my nephew’s friends made the trip to California to honor Eric. This young man will be remembered by his family and friends as compassionate, funny, the life of the party. What does that have to do with teaching? As we gear up for another year, I want to keep in mind that the important things I teach are those things that can’t be seen on a test paper, and can’t be measured and graphed. And I also want to remember that the most important things are taught by parents and the best I can do is reinforce things like honor, compassion, and duty. I would have been proud to have been Eric Williams’ teacher. To read more about Staff Sgt. Williams, click here. 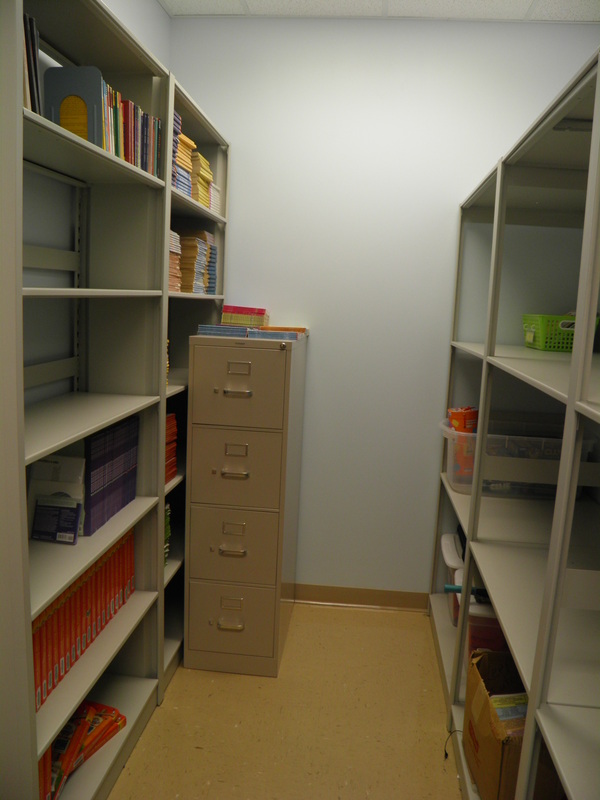 When I moved to my new school two years ago, I was in awe of all the storage space I had in my classroom. Most of one entire wall is filled with upper and lower cabinets – more storage than I’ve had in years. This is only a portion of the cabinets on this wall! But wait – there’s more! I also have a walk-in closet with metal shelving that I don’t even have to share with anyone else. I was amazed! However, coming in at the last minute, and not knowing what belonged to the school or the teacher who was out on leave, I basically left the closet untouched for a year. Fast forward a year. 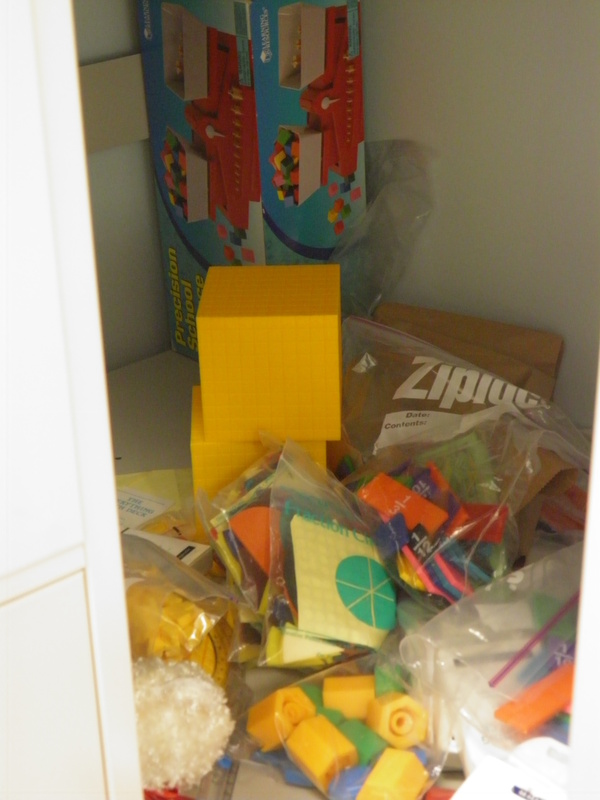 All that is left in the closet belongs to the school or to me. When I get back from vacation, my goal is to get everything else in its place, see what containers I need and containerize. Then I’ll need to find homes for the items that will not be returning to the closet, but which I still need to keep. I’ll have one day to get it done. Wish me luck! I’ve taken a long hiatus from blog writing – migraine, bad back, and bursitis have kept me in bed a great deal of time. Concentrating on much of anything was impossible. So I played with my grandson and rested. A lot. My head is in check for the time being, I’ve had steroids for my hip, and I found an amazing chiropractor who has greatly improved my back. Time to get back to life again! Currently, I’m spending time up in New York with my family, and last night a large group of us went to a free concert in town, starring my niece’s indie band, Brother Keep. They’re very good, by the way. You might want to check them out – they’re on Facebook, of course. 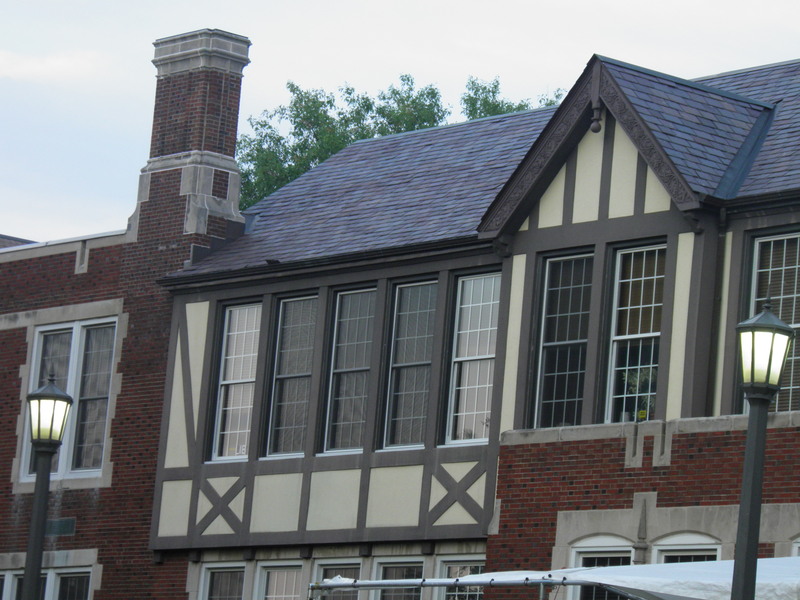 Anyway, the concerts are held weekly during the summer on the lawn of what was originally the town’s only school, serving kindergarten through 8th grade. My dad graduated from that school in 1947. 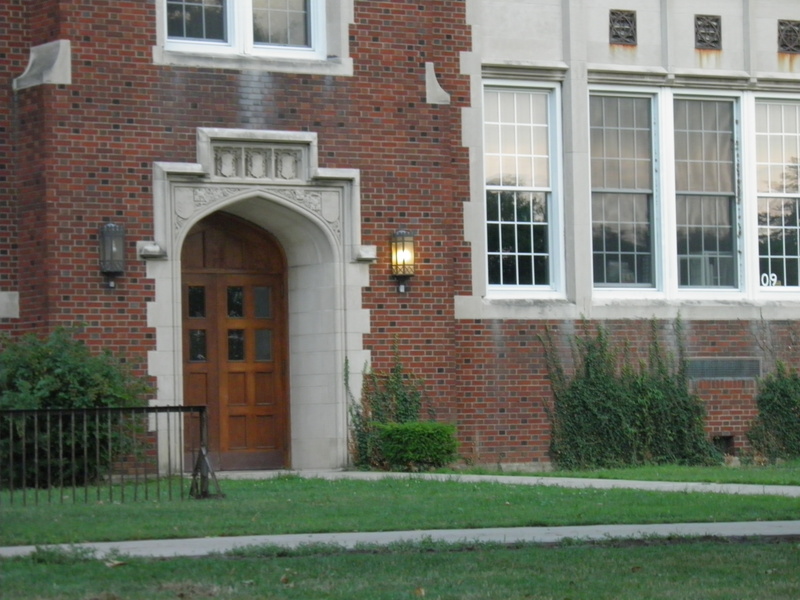 By the time I came through, it was a middle school, serving grades 5 – 8. As a teacher, you may have heard the rumor that middle schoolers aren’t particularly aware of others and their surroundings. I can wholeheartedly agree with that, from a personal standpoint. I never paid much attention to the school, except I knew it was old when I was there in the early 70s. I liked it, but a school’s a school, ya know? During the first music set, I took pictures of the band members for my niece. But during the second set, my eye wandered to the building itself. It is very traditional looking, and very geometric, but my brother and I noticed there is nothing symmetrical about the place. The left and right wings are not the same, but quite similar. The left and right front entrances are slightly different, the stone frames around the windows are quite similar, but not the same. Not even on the same set of windows. 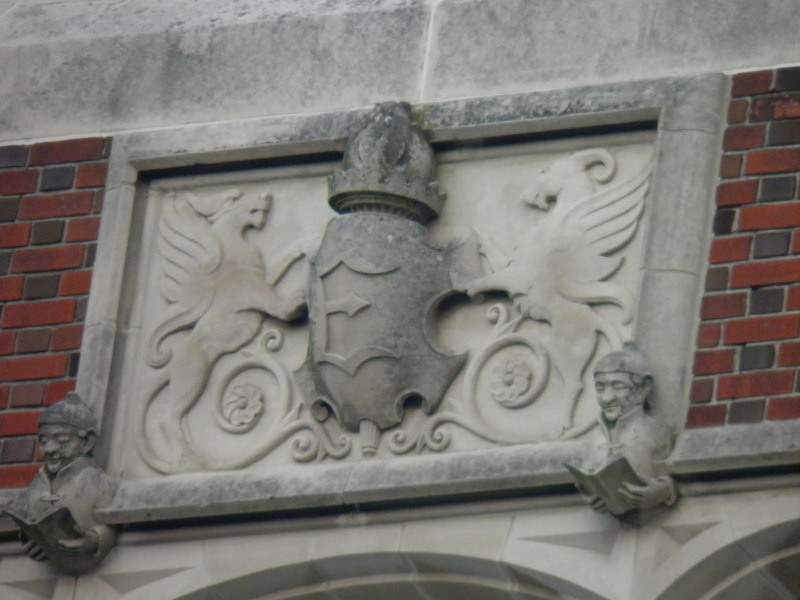 Then I found this gem up high above the main entrance. I had never noticed it before. How had I never noticed the giant E or the book readers? And this finally explained the insignia on my class ring. You’re looking at it. The dark woodwork inside the front entrance and outside on the eves is of grapes and grape vines, a common site in our part of the state. My cousin noticed that up in the four corners of the entrance foyer, in front of the auditorium are wood reliefs of wrestlers, boxers, baseball players, and football players, complete with leather helmets. This was an astonishing find to us, all former students in this school. How had we missed it? The most touching discovery for my brother, cousin, and I was of the teacher mailboxes just inside the front door. There were still names on yellowed pieces of paper, neatly typed on each box. We found a great many of our former middle school teachers’ names, as if they were still there. 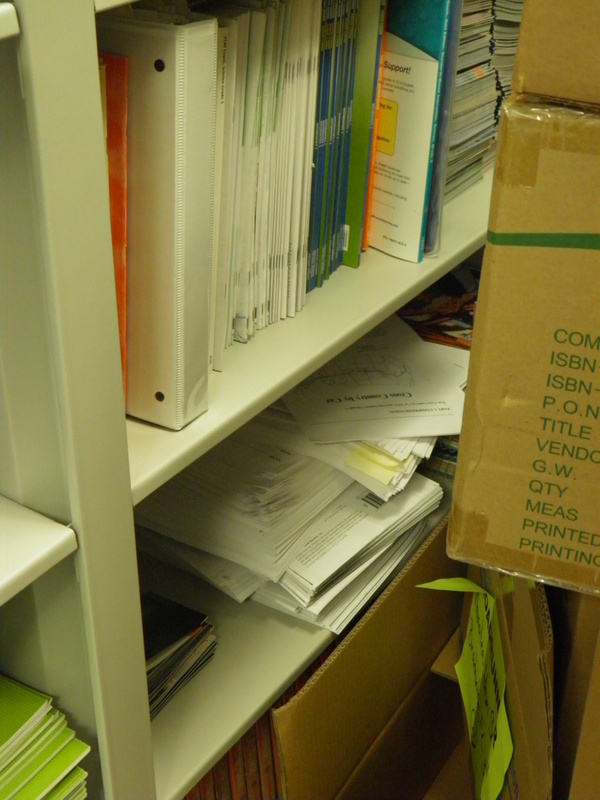 It must have been only a few years after we left that the boxes became obsolete. They sit empty, not having received mail in decades. My take away from all this is that it’s important to notice the details. The little things that are unique. The way something can be composed of unique individual parts, yet come together to make something that all fits together seamlessly into something grand and beautiful. Students – unique individuals can come together to make an amazing class, tightly knit, but woven of distinct personalities, talents, and gifts. Professionalism – the conduct, aims, or qualities that characterize or mark a profession or a professional person(see 1professional). That’s the definition according to www.merriam-webster.com. As educators, professionalism should be ingrained in us. We, as a profession, are often frustrated by the way the public perceives us and treats us. We feel maligned and under-appreciated by parents and disrespected by students. Yet, do we present ourselves and conduct ourselves as professionals? Fortunately, the majority of educators with whom I’ve worked in my career have easily fit the definition of professionalism as stated above. From them I have learned empathy, dedication, and a commitment to improving my practice. Unfortunately, those aren’t the ones who make headlines in the paper. Recently, I read about a teacher who made a horrible remark about a student ON FACEBOOK. Which of course, has landed him or her (I don’t know – don’t care) in the spotlight, and in the middle of a state investigation. The parent of the child is aware of the remark and angry – quite understandably. Maybe a course in professional behavior should be a requirement of certification or recertification. I don’t know what the answer is, but educators will never be looked up to as a whole as long as the unprofessional minority keep making headlines. Curiously, I googled professionalism and looked at the images available. There were medical teams, businessmen and women, many images of people at computers, and soldiers. There were not any photos of teachers. Common Core, Daily Five, and FL Next Generation Standards – Oh My! This summer I have tasked myself with developing plans for English Language Arts. Traditionally, this area has been distinctly taught as Reading and Writing, at different times of the day, and our current Next Generation Florida Sunshine State Standards (say that five times fast!) are set up that way. I am very excited to see that Common Core State Standards put the two subject areas together into ELA. 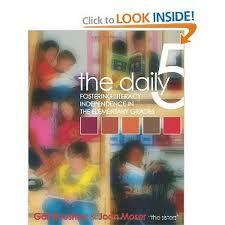 This works beautifully, I think, with my plan to incorporate The Daily Five into my day. If you’re not familiar with the Daily Five, it is really a structure of mini-lessons in reading, writing, and word work, alternated with choice times for students, allowing them time in the day to choose to read alone, with someone, listen to reading, work on writing, and doing word work. This structure may be a life saver for me as I will most likely have 4 – 5 fourth graders and around 15 fifth graders in my class. Yikes! To add to the complexity that will be my classroom, our school district recently decided to abandon early out Wednesdays, which gave us two hours a week for uninterrupted planning or staff development each week. That means that while our Wednesdays will again be full days, the other four days will shorten by about fifteen minutes each. Even with the previous longer days, it was a struggle to fit in our 90 minute reading block along with 45 minutes for writing. In theory, The Daily Five takes a chunk of the day. In fact, in a perfect world, it would take approximately 2 hours and 45 minutes to work through the literacy block. As it is, I will have somewhere around an hour and 50 minutes. So, I’m throwing a couple of questions out to the cosmos (that’s you!). Those of you in Florida teaching intermediate grades… Are you using the CCSS this fall, or are you still utilizing the Next Gen Standards? If you’re using Common Core, has your district given you any kind of road maps to follow? And to those of you using The Daily Five, if you have a more limited time each day to teach Reading and Writing, how to you adapt Daily Five to make it all fit in the time you have? I’d appreciate any insight any of you could share with me. Right now I feel like I’m trying to plan for The Daily Common Next Generation Core Sunshine State Five. Holy cow. I’d Like a Clutter-Free Classroom, Please. Waaaayyyy back in February, on Valentine’s Day to be exact, I wrote my first post for “Teaching: A How-To Guide”. My goal in starting this blog was to have a public record of my success in the Clutter-Free Classroom Project, which I somehow (Pinterest?) 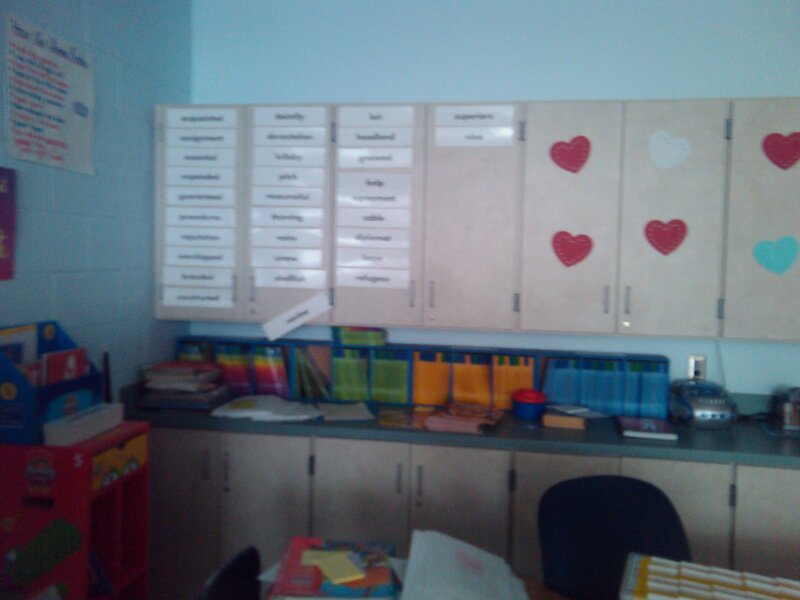 found on this amazing blog, The Clutter-Free Classroom. Its author is my hero these days! If you’re not already a regular reader, you need to head on over and see what you’re missing! Of course, as is typical for me, I came to the Project late by a month and a half, so I never really caught up. What with kids in the room all day, my chronic migraine flaring up big time as we got closer to state testing in April… you know how it is. I realized the day I was having my kids take a reading test while I dragged my area rug from one side of the room to the other that my project might not be in the best interest of my students at that particular moment. 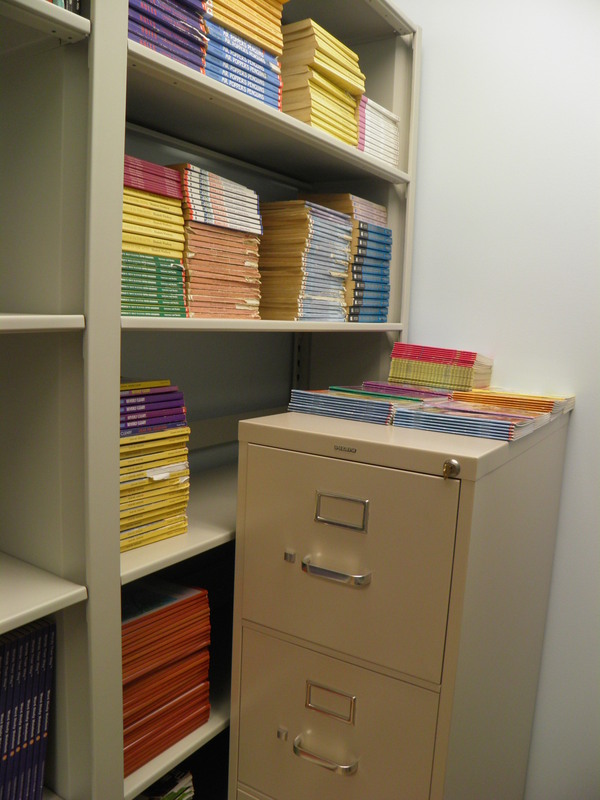 However, I vowed – yes I did – to return to the Clutter-Free Classroom Project when summer arrived. I have one week left of summer school and planning with my team. Then I’m going to hit that room hard until the custodians bodily remove me so they can clean. And I’ll be recording my progress here from now until the room is perfect, which allows me to keep blogging long after summer is over!